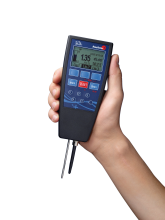 The robust and reliable DynoTester+ is the entry level handheld bubble tensiometer for process monitoring and quality control. Fast becoming the first choice for those looking for simple quality control of inkjet inks and monitoring the surfactant concentration in electroplating baths. The DynoTester+ bubble tensiometer measures surface tension and surfactant concentration easily & quickly. The mobile hand held instrument can be used directly on the production line or in the laboratory, it houses a display window which directly shows the user the measurement results and will alert the user if defined limit values are exceeded. 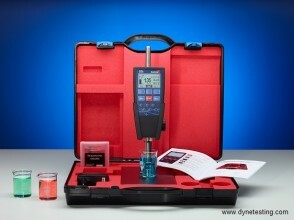 The DynoTester+ is very user friendly with little expertise needed to operate the instrument. With the Quick Start guide supplied and a bubble lifetime pre-selection, taking measurements can be done quickly and easily by the touch of a few buttons. Measurement data can be stored in the tensiometer, transferred to a computer via USB port or printed and with the optional Lab Solution Software you can also prepare a visual presentation, evaluation and further processing of measuring data. The instrument is supplied with 2 off PEEK or glass capillaries depending on the users application and spares capillaries are also available including disposable PTFE capillaries. Ideal for monitoring the concentration of detergents by measuring the surface tension. Measures the effective/free content of detergents in the bath, not the used/total. Optimising the dosage of detergents after consumption. Mobile metering equipment or fully integrated/automatic inline solution. Controlling the surfactant concentration in industrial parts cleaning industry. Monitoring the surfactant concentration in electroplating baths. Measuring the surface tension of liquids at the plant (atline) or in the laboratory (offline). Quality control of inkjet inks, paints and lacquers/varnishes. Incoming & outgoing inspections of surfactant containing goods. Mobile use for external work. Like all SITA Tensiometers, the DynoTester+ is based on the bubble pressure method for measuring the dynamic surface tension of liquids. Measurements are taken of the air pressure inside a capillary tube as air is bubbled through it whilst it is immersed in a liquid sample. As the pressure increases in the capillary tube bubbles are eventually pushed out into the liquid sample, the maximum pressure is achieved when the bubble shape is hemispherical, after which the bubble quickly grows and leaves the capillary. The force exerted on the bubble is determined by the surface tension of the liquid. Packing List: DynoTester+ Bubble Tensiometer; carrying case, capillaries (2 pieces) power supply, USB-cable, stand and instrument fastener, sample vessel (2 pieces), operating instructions & calibration certificate. Max. power consumption 2.5W max. Contact our Sales Team for the complete range of accessories or capillary selection.